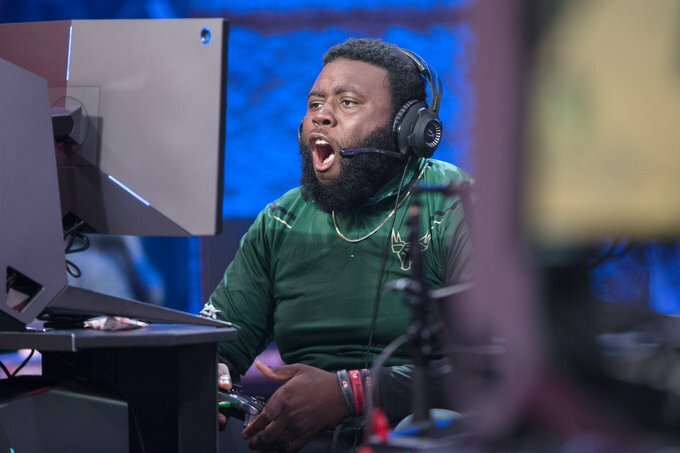 Bucks Gaming bookended its season one draft by protecting first-round pick Game6Drake and sixth-rounder BigMeek. The team acquired a second first-round pick by trading King_Peroxide to Blazer5 Gaming over the offseason. Drake, consequently, will be one of three first-round picks on the roster for season two. The Bucks failed to make much noise in season one, besides for a remarkable upset of 76ers GC in the Ticket tournament, but come season two Drake and co. are looking to make the rest of the league truly Fear the Deer. The Bucks guard talked with DIMER about his time with the Bucks, his personal goals for season two and his close friendship with his GFG Pro-Am teammates. DIMER: How was the season one experience with Bucks Gaming? Game6Drake: Season one was a rollercoaster since it was so new for everybody. I learned a lot, not only on the sticks but off the sticks as well. The city of Milwaukee grew on me a lot. We had a great team, but some things just didn’t click and we weren’t able to get ourselves over the hump. I take responsibility for that and can’t wait to redeem to myself from a subpar and disappointing season. DIMER: What was the best moment of the season? Game6Drake: The best moment of the season I would probably have to say was the first game in the Tipoff tourney or the Ticket tournament when we beat 76ers GC in the first round. The Tipoff tournament, being that it was the first-ever game in NBA 2K League history and that we had the honor of playing in that very first game, that’s really special to me. DIMER: Being protected for season two must be a great feeling. How do you readjust your mindset to prepare for season two? Game6Drake: Being protected means everything to me. Bucks Gaming believed in me when they picked me No. 10 overall in the inaugural entry draft. Although I had a disappointing first season they believed in me for season two. I’m coming into it with a different mindset. I was a lead-by-my-play guy, but I need to take over the vocal role more this season. With BigMeek and myself, my mindset is totally different, and I can’t wait to get started with whoever my four new teammates are. DIMER: You scored the first basket in NBA 2K League history. If you could pick one record to set this season, what would it be? Game6Drake: If I could pick one record to set this season, obviously people would say scoring or rebounding etc., but mine is something minor. Go consecutive games without a turnover, which is huge, especially for a guard who has the ball in his hands for the majority of the game, so I feel like going without a turnover for that long would be super cool. DIMER: You’ve got a lot of history with GFG. How does it feel to see their own paths continue to connect with yours in the league? Game6Drake: To see my GFG teammates Compete [third overall pick in season one by Utah Jazz Gaming, protected for season two] and Lotty [in the draft pool for season two] in this league means everything. We’ve grinded for this and we’ve taken some hard losses, but now everything is coming full circle and I’m happy for them. Now I’m just waiting for my other two teammates, Ty and Melo, who don’t get talked about enough, to eventually join me in the league. Then I’ll finally be at ease knowing my whole team is in but even now it’s a great thing to see.